So last week's post was all about my trip to Frederick, Maryland which was long on talented artists but short on a satisfying bike ride. Most of it was my own fault as not bringing my bike shoes really killed my mojo - and climbing hills that would have freaked out the Into Thin Air guy didn't help, either. But this time my wife wanted to participate in the Plein Air Easton quick draw event. She assured me this would be a better experience for Maryland cycling because of the flat terrain - and the fact that there's a rail trail there. Clearly, intense lobbying from people who willingly carry plastic bags with poop in them were able to eliminate Rule No. 5. The rail trail itself is rather short - less than three miles long - but it is a nice trail that could expand. Also, the very existence of it meant flat terrain, and the area around the Chesapeake Bay didn't disappoint. Another thing that didn't disappoint was Easton. This city figured out bike parking - a topic that has been gnawing at me lately for reasons I will get into another post. Businesses: if you want to impress me, do something like this: take the most convenient and most visible parking spot in your lot and turn it over to bicyclists. Don't forget to hollow out the parking meter if applicable. The nice iron racks, which feature tiny penny farthings, are all over Easton. And speaking of cycling in Easton, one has to single out Nanny Trippe and her gallery. I met Nanny and got to see some of her great bicycle (and other) artwork. 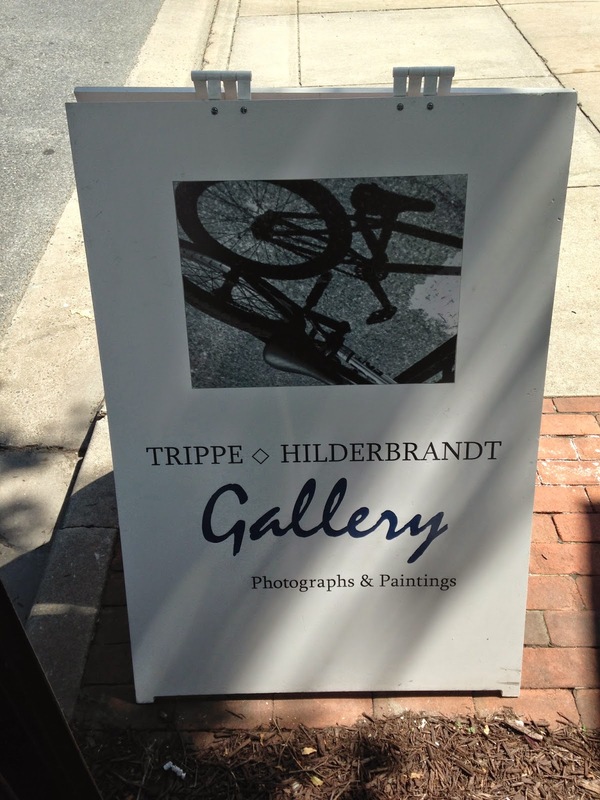 Whether you're a roadie or a mountain biker, the Trippe Hilderbrandt gallery is a must-go. Just like Frederick, my wife and I walked around town so she could figure out where she could paint. I helped her - but I was also scoping out my route in and out of town. The plan was to park the car not far from her spot and I'd ride from there - coming back, as before, in time to help her frame her work. Not only did I bring my bike shoes this time, but I also gave myself a bigger window of time to ride by leaving well before the start of the quick draw. 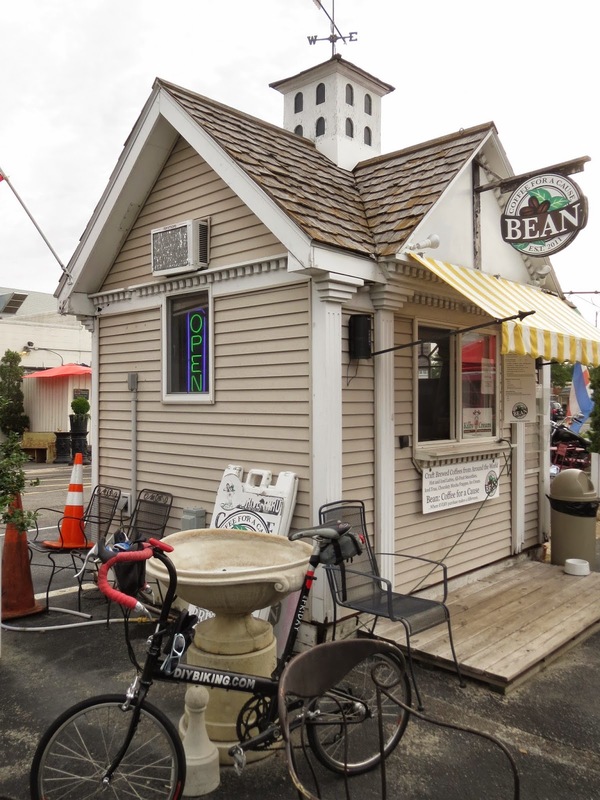 To ensure I'd be riding properly fueled, I stopped at one of the charming, garden shed-sized coffee shops in this part of the country: Bean - Coffee for a Cause. After I drank coffee I felt comfortable enough to take off through Easton. Very quickly, the ride had a different feel than the one I took in Frederick. While the main road I had used there had a shoulder unfit for a mouse on a tiny bike, the road outside of Frederick leading to St. Michael's features a bike lane that can best be described as plus size. Bring your widest budget supertrike. This is the kind of area built for doing a century. The Bike Friday routinely passed 20 miles an hour as the caffeine worked its way through my bloodstream. I passed cornfields, some people who looked like they were selling crab cakes from the back of a pickup truck, and a few other cyclists before coming to civilization…or, rather, Maryland's version of it. I'll take signs never seen in Stamford for $200, please. St. Michael's, which features some nice restaurants - Bistro was quite good - was the perfect destination as I was sure I'd make it back in time to help my wife with her painting if she needed me. I also had the chance to visit Shore Pedal & Paddle - a place to rent both bikes and kayaks should you visit the area without either. I made a few detours to tag sales on the way back, but I was having too much fun cranking out the miles to stop too often. As the clock began to run out on the noon deadline, I returned to Easton and was very proud of the amount of distance I had gone - 34 miles - and the amount of time I needed to do it. I arrived with ten minutes to spare and even got to see several artists (including some who had the good sense to bring their own bikes) putting the finishing touches on their work. I stowed the Bike Friday in the car and met up with my wife - who had finished her work and was watching the watercolors dry. Aside from cleaning the glass on the picture frame I didn't do much to help her frame it for the sale portion of the event. Unlike Frederick, Easton was able to hold the event outside - and I always enjoy the sight of people wandering on car-free streets (and I thank The Bartlett Pear Inn for having a nice porch from which I could take this picture). She set up her work and, in the time it took me to bring something to the car and then walk back, her work had sold. Yeah, she's that good (and you can see what she painted on her web site). I shared with her that day's ride and she was happy to hear I had the anti-Frederick cycling experience. And she had sold two of her quick-draw works at two shows in a row. Now I'm not ruling out a return to Frederick, but I do have to say at this point I like Easton a whole lot better. We'll be back - and probably to once again mingle with the artists. Thanks for reading and thanks for riding.